When visiting Bangkok, many tourists area drawn to the neighboring country of Cambodia and the city of Siem Reap, known as the gateway to the spectacular temples of Angkor. Around 400 kilometers (250 miles) away, the distance is short enough to consider this side trip, and well worth the time and money it will cost you to get to see one of the world’s most impressive UNESCO World Heritage Sites. There’s often a lot of talk around tour companies scamming naïve tourists, so we’ve put together a guide that should help you to make the best decision when it comes to traveling from Bangkok to Siem Reap. As you would probably expect, taking a flight from Bangkok to Siem Reap is by far the quickest way to get to Angkor, but it’s also the most expensive. For some time there was only one airline covering this route, Bangkok Airways, and because they were the only option they charged a very high fare, especially considering the flight is only one hour in duration. Luckily for us, there are now a few other options so an airfare with Bangkok Airways has gone down in price as a result, though bear in mind that this is still the most expensive airline to use. 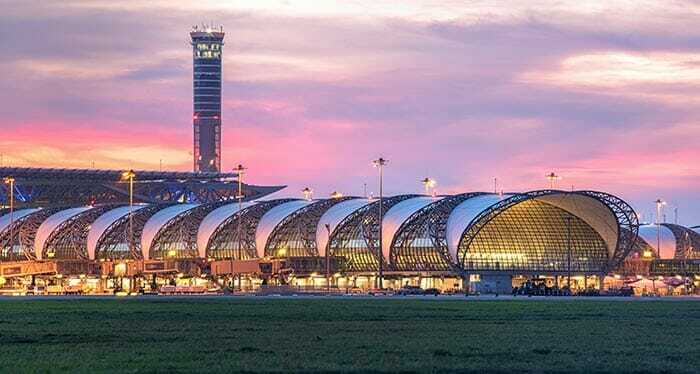 Bangkok Airways flies from the more modern Bangkok Suvarnabhumi Airport, as do two other carriers: Thai Airways (operated by Thai Smile), and Cambodia Angkor Air. Another option is Thai AirAsia and they fly from Bangkok Don Mueang Airport. When you’re researching flights you should first bear in mind which airport they are flying from and also take a look at things like baggage allowances as these can vary. If you have to pay for extra baggage this can quickly up the price of your airfare, so be sure to consider this. In general, Thai AirAsia should be offering the most affordable flights from Bangkok to Siem Reap but as always, the earlier you book the better the deal you can get. Although flying is the most expensive option it is by far the quickest, and some say the easiest, way to get to Siem Reap. 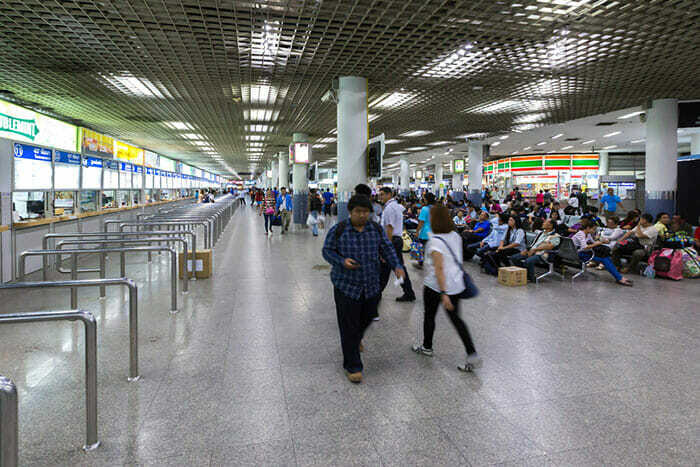 Once you’ve made your way to the airport the flight takes only an hour and you can pay for a Cambodia tourist visa once you arrive, going through immigration. Outside the airport there are several options for the journey into town. If you’ve already arranged your accommodation there will likely be the option to have your hotel come to pick you up, often for free. Taxis can be pre-paid so you know you won’t be ripped off by a greedy driver, by using the pre-paid booths outside the terminal. It’s the bus operators who have given the trip from Bangkok to Siem Reap such a bad name. There are a number of unscrupulous tour companies who will con you out of far more money than they should, promising to get you your visa etc for an inflated cost. Bus journeys can also be horrendously long, stopping multiple times at places along the way and encouraging you to spend more money. Luckily there is now a far more reliable bus service from Bangkok to Siem Reap, and at a far lower cost than an air ticket, taking the bus is actually a very good option. A direct bus service travels from the Mo Chit Northern bus terminal in Bangkok with two morning departures every day. For a very reasonable price this bus will take you all the way to Siem Reap, but remember that you are crossing an international border so read on to find out how this all works. Aranyaprathet (Thailand) - Poipet (Cambodia) Border crossing © withGod / Shutterstock, Inc.
On the direct bus mentioned above, you’ll be taken to the border at Aranyaprathet. Far from just dumping you there and expecting you to make your own way, the helpful staff will tell you what you need to do. Basically it involves getting off the bus (leave your baggage on there but be sure to take your valuables, passport etc with you), walking a short distance to the Cambodian border and buying your entry visa. 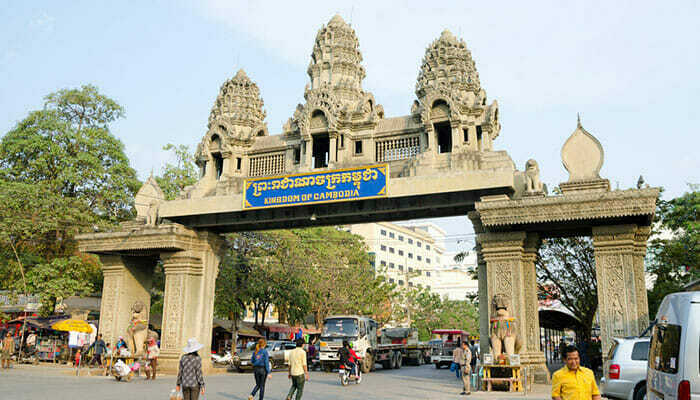 Once you’ve secured your visa you’ll officially be in Cambodia, in the town of Poipet. The same bus you traveled to the border on will be waiting for you, with your baggage still on there, and it will then go direct to Siem Reap. As buses go, this isn’t the cheapest option, but for convenience and little in the way of hassle, this direct bus is a great choice. Next you’ll need to get yourself from Poipet to Siem Reap. The newly paved road makes this journey a little less painful than it used to be! Taxis will cost somewhere between $30 and $50US and should take around 90 minutes, while a bus is a lot cheaper and longer. The final option is affordable but is actually slower than all the other options. Taking a train from Bangkok to the Cambodian border is cheap and if you have the time to spare (takes around 6 hours) it’s actually a very nice and scenic way to travel. 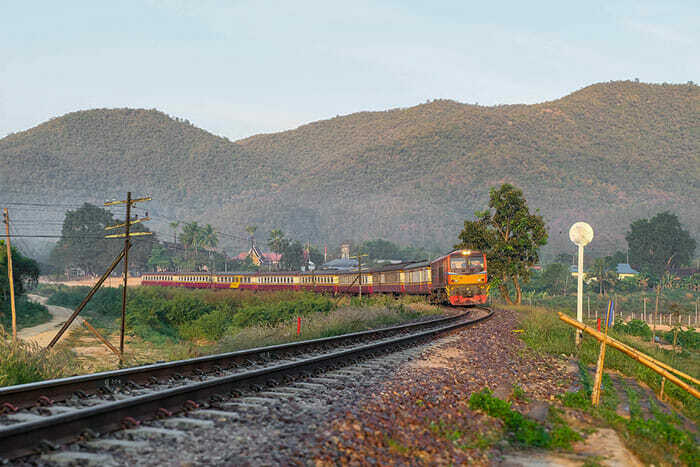 With this option you’ll still need to get from the border to Siem Reap under your own steam, after crossing the border, so weigh up the pros and cons as to which method would work best for you according to your timescale and budget.